The advancements and innovation in Medical technology over the last few decades has been instrumental in helping achieve the aspirations of many societies for their citizens to live longer and healthier lives. 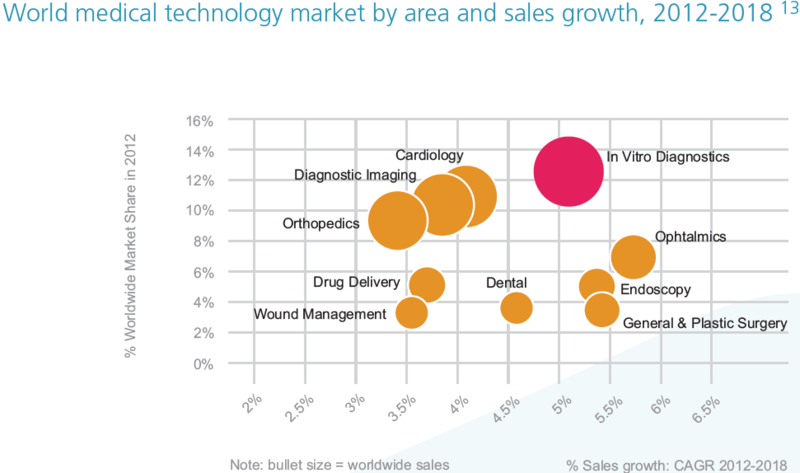 The Medical Devices Market is a highly diverse one, where there are currently more than 500,000 technologies available internationally, in 20,000 generic groups — which fall into 16 broad sub-categories of products — ranging from active implantable devices to laboratory equipment – as determined by the Global Medical Devices Nomenclature (GMDN) Agency1. From latex gloves, syringes and vacutainers to high tech scanners, implantable devices and replacement joints; Medical Devices all share a common purpose – the beneficial impact on health and quality of life. They all contribute to a society that lives longer and lives better, with improved disease diagnosis, monitoring and treatment. Medical Technology, devices and services help people to live healthier, more independent and socially active lives with improved employability and whether these technologies be employed at home, in hospital or at a care facility in the community –the value to the individual and society as a whole is undeniable As a result they enhance not only the quality of care provided but also the efficiency and sustainability of various healthcare systems as well as being major contributors to regional and global economies and economic prosperity2. 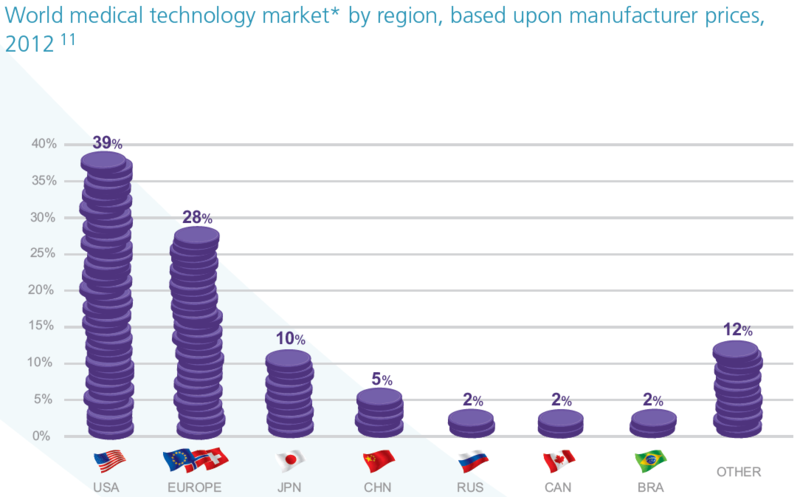 The Medical Device sector is a well established Global Market demonstrating both high profit yields and positive annual growth – globally the Medical Technology Market was worth over $320bn3 in 2012 with growth predicted to reach $398bn by 20173. The US has the largest share of this market (~40%) with the EU holding the second largest global share in the Medical Device Market, estimated to be around 30%. Investment in Medical Technology in Europe is set to grow over the coming years due to changing healthcare models, strong government and private sector investment in treatment innovation, to remain at the forefront of technological developments and maintain high standards of care, as well as ongoing Government initiatives to further target societal health inequalities and opportunities from new emerging markets are all helping to drive investment & market growth. According to BMI’s Q316 Medical Device Risk Reward Index – Europe ranks as the most attractive region in the world in which to commercialise a medical device, where Germany is the most attractive market in the region, followed closely by the UK4. Despite this positive growth however, the Medical Device Sector is facing a time of unprecedented challenges and changes in response to major trends in healthcare which are redefining and reforming the medical and surgical market on a global scale. London based Market researchers and business information providers, Visiongain, reported in 2013 that over the coming decade Medical Device Markets will witness significant opportunities for growth3 – with this market expansion driven by the aging global population, associated illnesses and subsequent demand for new innovation. This growth however will be on a backdrop of tighter regulatory and reimbursement policies, especially in new emerging economies and markets which means that medical Device manufacturers will need to develop more cost effective strategies for their products as well as more dynamic sales and marketing strategies in order to remain competitive. Epsicom industry research has emphasised the importance of factors driving market growth in Europe and the UK; including the ageing population, increasing health expenditure, the expansion of the private health sector, projects focusing on the upgrading of healthcare facilities and the receipt of EU and other international funding4. This is further supported by the global management consulting giant A.T. Kearney, who reported in 2015 that the model of healthcare provision is following a global trend of shifting care out of more expensive specialist hospitals to cheaper platforms such as community settings and ambulatory facilities and including expanding roles of other healthcare professionals such as Advanced Nurse Practitioners, Pharmacists and therapists5. These changes will affect healthcare providers and Medical device manufactures in multiple ways as products are increasingly directed to new physical locations and intended for use by different healthcare providers. In the respect of the UK sector, this will have a greater implication for tendering to the new emerging independent and private sector contractors. In 2015, A.T. Kearney highlighted the need for device manufacturers to develop new marketing strategies to face these unprecedented challenges and to get ahead of the curve in an evolving market. Medical device manufactures will need to develop more dynamic marketing strategies and new delivery models with a focus on sales, distribution, partnership management, complete end to end solutions and services far above and beyond the medical device itself5. This highlights the importance of companies moving away from traditional undifferentiated business models towards more concentrated and distinctive marketing strategies in order to remain effective in the changing market. This sentiment has been further echoed by other Market researchers in Europe6, where the Medical Device Industry has seen continuing growth due to increased awareness in many member states surrounding the early diagnosis and treatment of medical conditions, better access to advanced technologies and a rise in the number of healthcare informed patients. As seen in the UK and wider areas of Europe; life expectancy has increased as the gap in health inequalities shrinks and with an ageing population comes the increasing prevalence of age related diseases and the long term effects of disease progression in chronic illnesses such as Diabetes and cardiovascular disease which previously were relatively unknown. Historically, the principle purchaser of medical equipment and driver for growth in the UK Medical Device Sector has been the National Health Service, which has previously provided as much as 85% of Britain’s healthcare. However in recent years this market has seen unprecedented changes not only in terms of consumer usage, as more UK consumers are moving towards private medical treatments but more significantly at a provider level with the radical reform of NHS infrastructure and subsequent opening up to free market forces. The Health and Social Care act 2012 has allowed for the expanding role of choice and competition in the NHS with an ever increasing scope for competitive tendering by non-NHS providers. 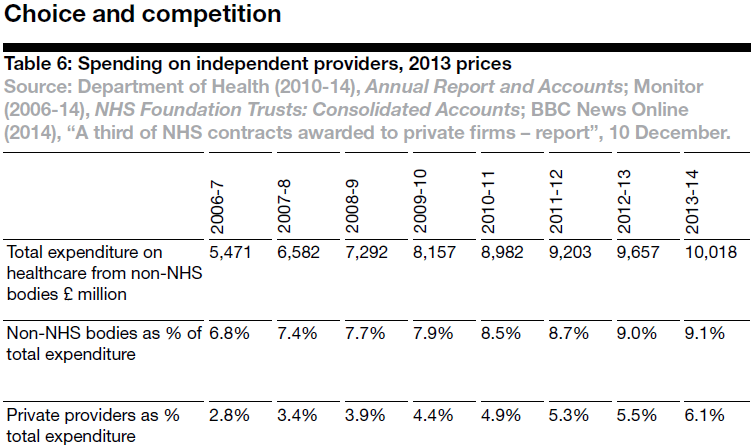 Although the provision of acute services is still very much in the NHS domain, there has been an increasing trend towards independent contractors in community based service provision and diagnostic services -of those put out for competitive tenders, private sector providers have been by far the most successful in bidding; winning approximately 40% of bids7. Further enshrining this complete reform of the National Health Service is the ‘NHS 5 year forward view’ which set out new ideas for the delivery of services; with an emphasis on new models of care and fiscal plans for the management of funding and the aim to deliver better, more efficient care with less resource in the face of increasing demand. Published in October 2014, this new view for the future of the NHS was developed by collaboration with partner organisations such as Public Health England, NHS Improvement and the Care Quality Commission as well as feedback from Independent experts, Clinicians and Patient Groups in order to best address how the NHS needs to evolve in the future to meet these objectives. The 5 year forward view intends for these changes to be effective and long lasting with services still being nationally enabled but most importantly; locally led9. This “meaningful local flexibility”8 and reform would create a National Health Service which is essentially less subject to national control & solutions and much more open to the free market and outside competition from the independent and private sector in order to meet these goals – heralding a new dawn on the landscape of British healthcare. 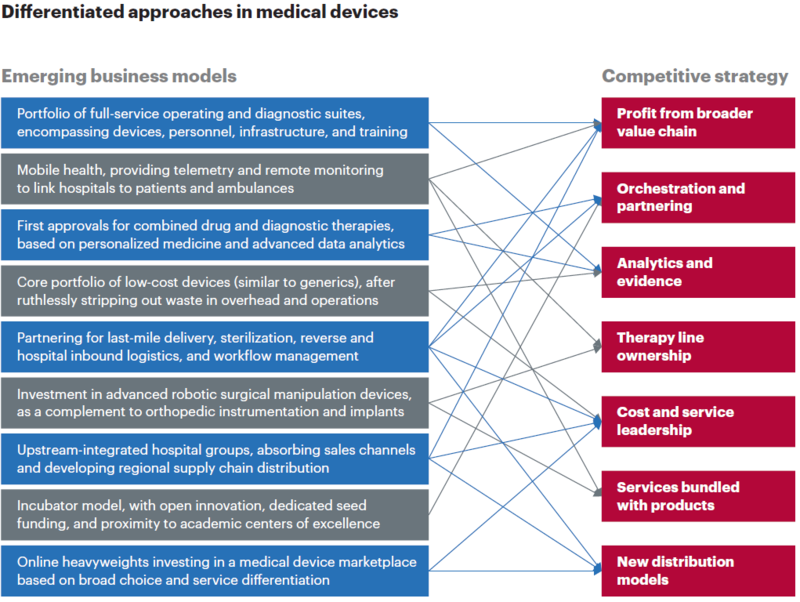 The message is clear – the Medical Devices market is changing – in order to face the challenges, stay ahead of the curve and capitalise on new opportunities in an evolving healthcare landscape, Device manufacturers need to develop a new vision for the future. A vision that includes more competitive dynamic marketing & sales strategies which are individualised to the customer’s needs, provide end-to-end solutions and services to their customer beyond just the device. Doing so will ensure long term mutually beneficial partnerships between customer and client… and that is where we at Cash Cow Marketing can help. What can Cash Cow Marketing do for you? Cow’s enjoy an almost 360 degree panoramic view of their playing field and at Cash Cow Marketing we take a Cow’s eye view in everything we do. Our unique 360 degree perspective and completely integrated marketing strategies form the back bone of our service – we believe that maximum results require maximum vision and our vision allows us to provide a personalised and completely unique marketing strategy for each and every client ensuring that all bases are covered and all options and avenues are explored – from inception to delivery and beyond, we are with you every step of the journey. In a post Brexit climate, a new era is dawning and we can provide the unique perspective to help you navigate the challenges ahead and evolve your marketing strategies to reap the benefits of a new developing market ahead of the rest of the ‘herd’.